2 At nlc, we provide you with the easiest, lowest-cost way to own and run the car of your choice. We take care of all your automotive needs, including car purchase, finance, insurance, fuel, servicing and repairs, as well as selling or trading-in your current car. What is a Novated Lease? A novated lease is a car finance option that allows you to treat your personal car like a company car. When you salary package a novated lease, you agree to forgo a portion of your salary in return for a fully-maintained car. This allows you to make significant tax savings, in addition to the added convenience and extra savings associated with packaging your car with nlc. At nlc, we help you to set a budget to cover your car s expenses over the life of your lease, which is then deducted by your employer as a set amount each pay cycle. nlc uses these regular deductions to manage and pay for all of your car s running costs, including: Finance Fuel Servicing and repairs Tyres Registration Insurance Roadside Assist Carbon Reverse How it Works A novated lease is a three party agreement between you, your employer and nlc. You enter into a finance lease with nlc, and then a second document called a novation agreement is used to transfer some of your lease obligations to your employer. 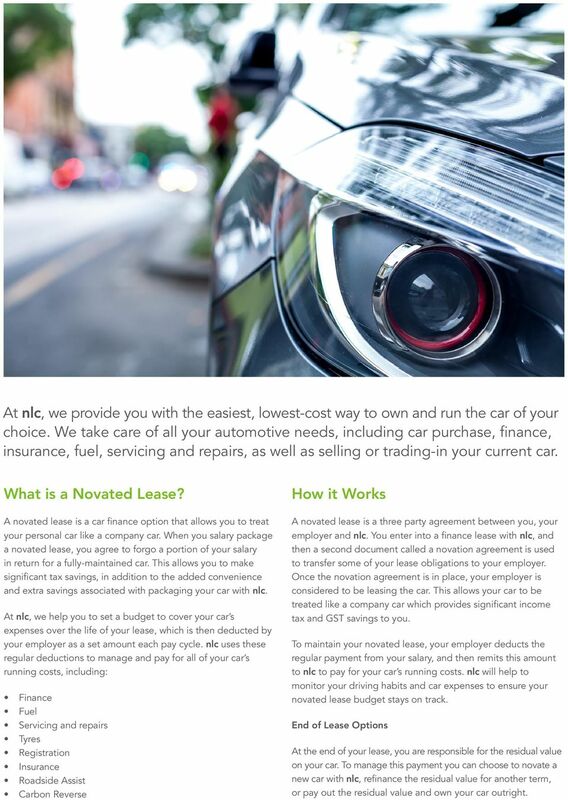 Once the novation agreement is in place, your employer is considered to be leasing the car. This allows your car to be treated like a company car which provides significant income tax and GST savings to you. To maintain your novated lease, your employer deducts the regular payment from your salary, and then remits this amount to nlc to pay for your car s running costs. nlc will help to monitor your driving habits and car expenses to ensure your novated lease budget stays on track. End of Lease Options At the end of your lease, you are responsible for the residual value on your car. To manage this payment you can choose to novate a new car with nlc, refinance the residual value for another term, or pay out the residual value and own your car outright. 3 Features and Benefits Income Tax Savings Under a novated lease, your car s running costs are paid for with a mix of pre-tax and post-tax dollars, reducing your taxable income. This may allow you to make significant income tax savings, increasing your take-home pay. GST Savings nlc purchases the car on your behalf and claims back the GST, so you save the GST on the purchase price. You can also save the GST on the running costs of the car including fuel, service, maintenance and tyres. This is subject to your employer s salary packaging policy. Car Purchase Use nlc s expert car buying service to get better pricing on the new car of your choice. You can also choose to novate a used car or the car you currently own, as well as novate more than one car, subject to your employer s salary packaging policy. Repair Assistance nlc Repair Assistance takes care of all your car s scheduled servicing, maintenance and repairs. Our team of repair specialists provide fleet savings on parts and labour, and act on your behalf to avoid over-servicing and over-charging. Fuel Card Enjoy the convenience of using your nlc Fuel Card to pay for fuel at over 90% of all suppliers nationwide. Save from 3 cents a litre when you fill up at BP sites where the nlc fuel card is accepted. Budgeting We help you budget for all of the finance and running expenses over the life of your lease. A set payment is then deducted by your employer each pay cycle to manage your lease. Online Account Your nlc online account gives you 24/7 access to keep track of your vehicle expenses, including transaction and history reports. Fringe Benefits Tax (FBT) A novated lease allows you to reduce your taxable income, therefore reducing your PAYG income tax. To offset some of this reduction in income tax, the Australian Tax Office (ATO) levies another tax called Fringe Benefits Tax (FBT) on the novated lease that your employer provides to you. The amount of FBT levied on your novated lease is calculated using the statutory formula method and is mainly determined by the value of the car you choose to package. A novated lease is tax effective because, in most cases your income tax savings will be greater than the FBT payable on your car. If your taxable salary is less than $180,000 per annum, nlc will structure your salary package using a combination of pre and post-tax deductions. The post-tax deductions are used to offset the FBT liability payable on the car. This method of salary packaging is called the Employee Contribution Method (ECM) and nlc will calculate the ratio of pre and post-tax deductions to cancel out your FBT liability and maximise your tax benefit. Choosing Your Car Under a novated lease, you can novate any car that best suits your needs, provided that it fits within the ATO s definition of a car and any restrictions under your employer s vehicle policy. You can choose a new car, a used car with a minimum purchase price of $10,000 (nlc will need to confirm minimum value guidelines), or a Sale and Leaseback of the car you currently own. Am I Eligible? The first thing you need to check is whether you re eligible for a novated lease by referring to your employer s salary packaging policy. You don t have to earn a huge salary, or use your car for business for it to be worthwhile. When you call us, your dedicated consultant will provide you with an individual benefit assessment based on your specific situation, to work out how much you can save. 4 Novated Lease Comparison To show how a novated lease provides significant savings we have created a comparison using two employees Chris and Jenny. They both earn $85,000 a year and plan to buy a new 2015 Mazda CX-5 Maxx Sport 2.5L, 6 speed auto AWD at recommended driveaway price of $37,442 (including GST). They are both using a 4 year term and drive about 18,000 km per year. Chris Story Personal Finance Chris is buying the car as a private individual so he has to pay the GST on the car (10%). He will finance the GST inclusive cost, $37,442. Chris also pays the GST on his running costs (insurance, fuel and maintenance). 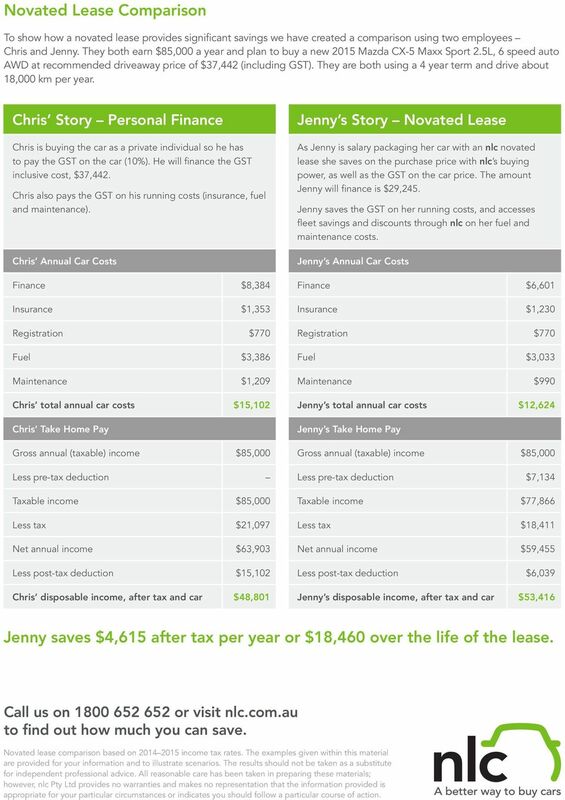 Chris Annual Car Costs Jenny s Story Novated Lease As Jenny is salary packaging her car with an nlc novated lease she saves on the purchase price with nlc s buying power, as well as the GST on the car price. The amount Jenny will finance is $29,245. Jenny saves the GST on her running costs, and accesses fleet savings and discounts through nlc on her fuel and maintenance costs. Jenny s Annual Car Costs Finance $8,384 Finance $6,601 Insurance $1,353 Insurance $1,230 Registration $770 Registration $770 Fuel $3,386 Fuel $3,033 Maintenance $1,209 Maintenance $990 Chris total annual car costs $15,102 Jenny s total annual car costs $12,624 Chris Take Home Pay Jenny s Take Home Pay Gross annual (taxable) income $85,000 Gross annual (taxable) income $85,000 Less pre-tax deduction Less pre-tax deduction $7,134 Taxable income $85,000 Taxable income $77,866 Less tax $21,097 Less tax $18,411 Net annual income $63,903 Net annual income $59,455 Less post-tax deduction $15,102 Less post-tax deduction $6,039 Chris disposable income, after tax and car $48,801 Jenny s disposable income, after tax and car $53,416 Jenny saves $4,615 after tax per year or $18,460 over the life of the lease. Call us on or visit nlc.com.au to find out how much you can save. Novated lease comparison based on income tax rates. The examples given within this material are provided for your information and to illustrate scenarios. The results should not be taken as a substitute for independent professional advice. All reasonable care has been taken in preparing these materials; however, nlc Pty Ltd provides no warranties and makes no representation that the information provided is appropriate for your particular circumstances or indicates you should follow a particular course of action. 5 Frequently Asked Questions What is a novated lease? A novated lease is a car finance option that allows you to treat your personal car like a company car. It s a three way agreement between you, your employer and nlc. 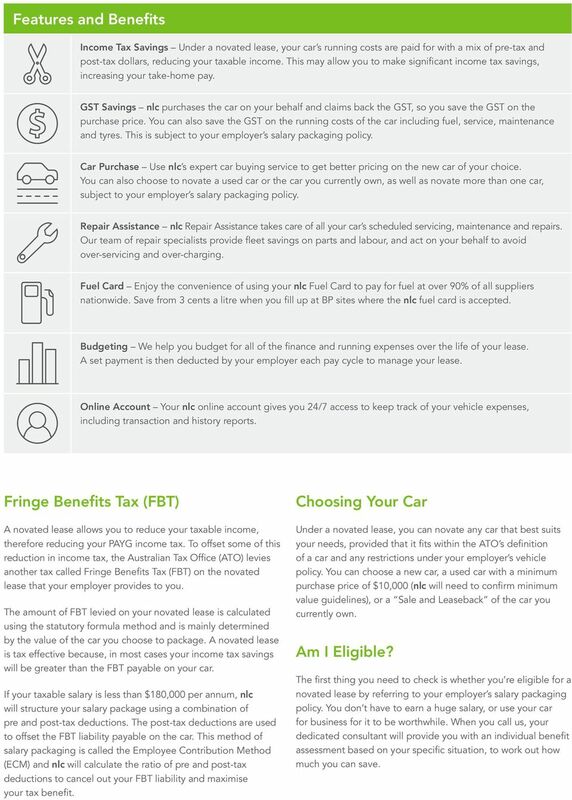 As one of the most cost-effective car ownership options for Australians, it allows you to access income tax and GST savings through your employer, as well as extra fleet discounts and the ease of having a fully-maintained car with nlc. How does a novated lease work? Under a novated lease, you agree to forgo a portion of your salary to cover your car s running costs, some of which you can pay for in pre-tax dollars. At nlc, we then use your regular salary deductions to pay for your cars running costs on your behalf. This includes finance, insurance, registration, fuel, servicing and tyres, which makes running your car much easier and more affordable. What are the main reasons you would choose a novated lease? 1. 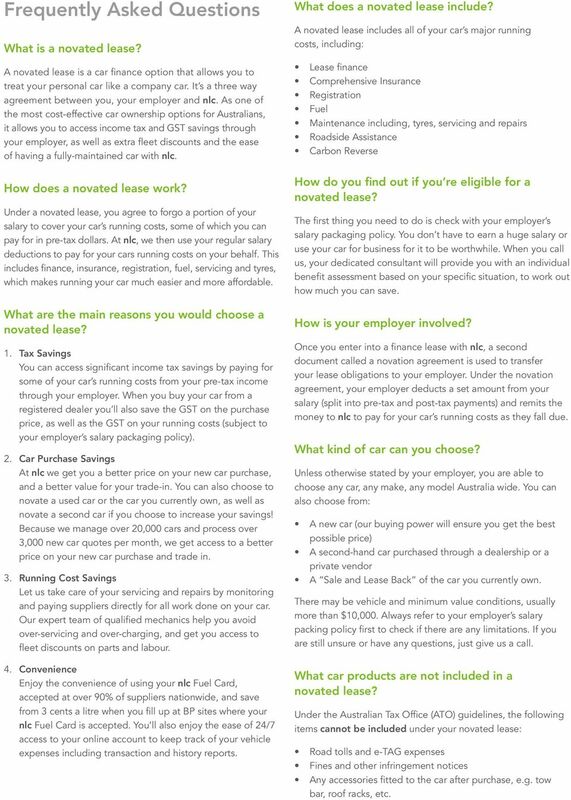 Tax Savings You can access significant income tax savings by paying for some of your car s running costs from your pre-tax income through your employer. When you buy your car from a registered dealer you ll also save the GST on the purchase price, as well as the GST on your running costs (subject to your employer s salary packaging policy). 2. Car Purchase Savings At nlc we get you a better price on your new car purchase, and a better value for your trade-in. You can also choose to novate a used car or the car you currently own, as well as novate a second car if you choose to increase your savings! Because we manage over 20,000 cars and process over 3,000 new car quotes per month, we get access to a better price on your new car purchase and trade in. 3. Running Cost Savings Let us take care of your servicing and repairs by monitoring and paying suppliers directly for all work done on your car. Our expert team of qualified mechanics help you avoid over-servicing and over-charging, and get you access to fleet discounts on parts and labour. 4. Convenience Enjoy the convenience of using your nlc Fuel Card, accepted at over 90% of suppliers nationwide, and save from 3 cents a litre when you fill up at BP sites where your nlc Fuel Card is accepted. You ll also enjoy the ease of 24/7 access to your online account to keep track of your vehicle expenses including transaction and history reports. What does a novated lease include? A novated lease includes all of your car s major running costs, including: Lease finance Comprehensive Insurance Registration Fuel Maintenance including, tyres, servicing and repairs Roadside Assistance Carbon Reverse How do you find out if you re eligible for a novated lease? The first thing you need to do is check with your employer s salary packaging policy. You don t have to earn a huge salary or use your car for business for it to be worthwhile. When you call us, your dedicated consultant will provide you with an individual benefit assessment based on your specific situation, to work out how much you can save. How is your employer involved? Once you enter into a finance lease with nlc, a second document called a novation agreement is used to transfer your lease obligations to your employer. Under the novation agreement, your employer deducts a set amount from your salary (split into pre-tax and post-tax payments) and remits the money to nlc to pay for your car s running costs as they fall due. What kind of car can you choose? Unless otherwise stated by your employer, you are able to choose any car, any make, any model Australia wide. You can also choose from: A new car (our buying power will ensure you get the best possible price) A second-hand car purchased through a dealership or a private vendor A Sale and Lease Back of the car you currently own. There may be vehicle and minimum value conditions, usually more than $10,000. Always refer to your employer s salary packing policy first to check if there are any limitations. If you are still unsure or have any questions, just give us a call. What car products are not included in a novated lease? 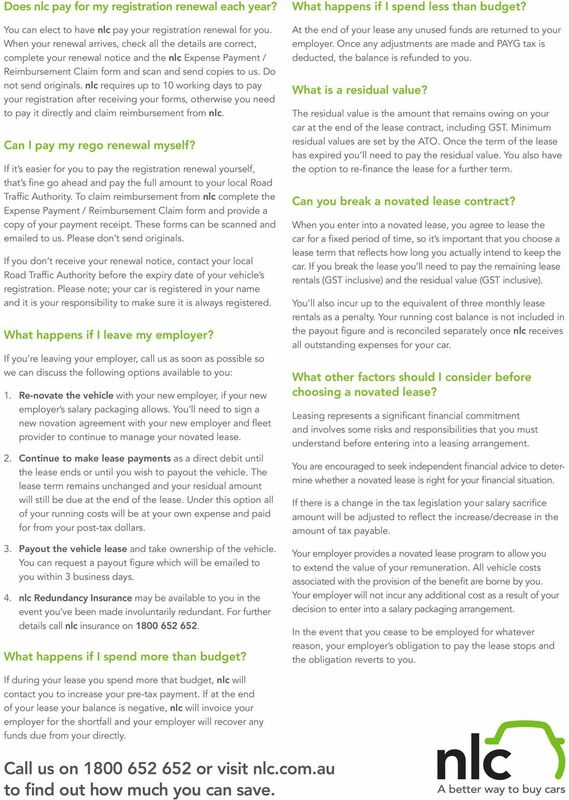 Under the Australian Tax Office (ATO) guidelines, the following items cannot be included under your novated lease: Road tolls and e-tag expenses Fines and other infringement notices Any accessories fitted to the car after purchase, e.g. tow bar, roof racks, etc. 6 Is Roadside Assistance included? nlc s Roadside Assistance is available to all of our novated lease customers. When you re stuck on the side of the road, rest assured you have someone to call, 24 hours a day, 7 days a week, nationwide. 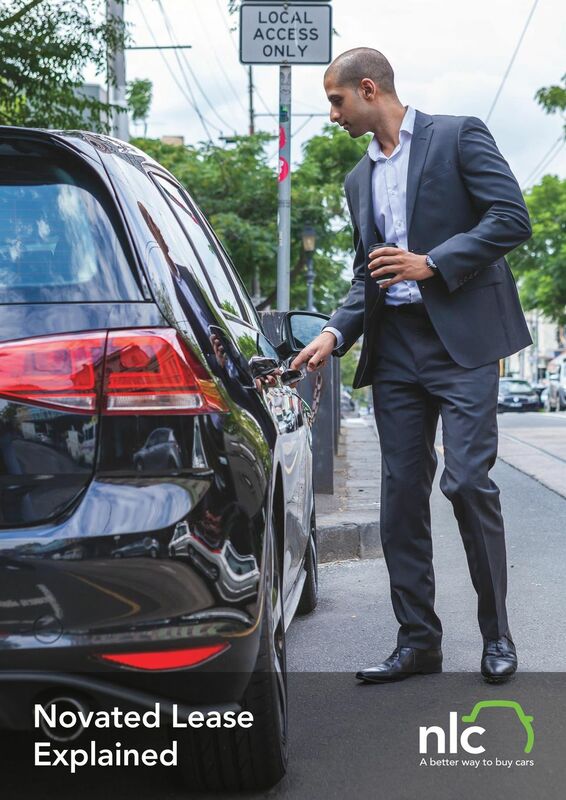 We offer our drivers the option to include Roadside Assistance as part of your car management budget for the life of the lease. Can I organise my own Roadside Assistance? Sure, if you ve organised your own Roadside Assistance, make sure you contact them directly to fully understand their policy as it may not cover the life of your novated lease, and contact them in the event of a breakdown. For nlc Roadside Assistance, call , 24 hours a day, 7 days a week. Can I offset my car s carbon emissions? 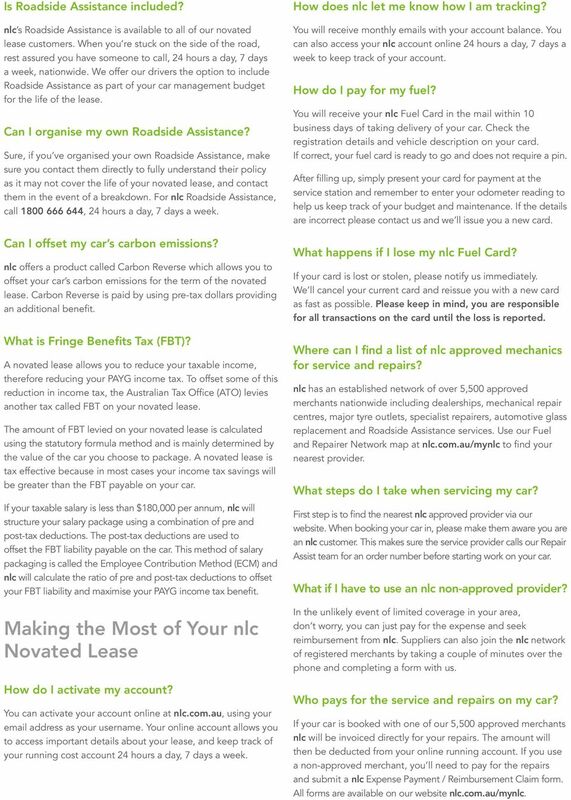 nlc offers a product called Carbon Reverse which allows you to offset your car s carbon emissions for the term of the novated lease. Carbon Reverse is paid by using pre-tax dollars providing an additional benefit. What is Fringe Benefits Tax (FBT)? A novated lease allows you to reduce your taxable income, therefore reducing your PAYG income tax. To offset some of this reduction in income tax, the Australian Tax Office (ATO) levies another tax called FBT on your novated lease. The amount of FBT levied on your novated lease is calculated using the statutory formula method and is mainly determined by the value of the car you choose to package. A novated lease is tax effective because in most cases your income tax savings will be greater than the FBT payable on your car. If your taxable salary is less than $180,000 per annum, nlc will structure your salary package using a combination of pre and post-tax deductions. The post-tax deductions are used to offset the FBT liability payable on the car. This method of salary packaging is called the Employee Contribution Method (ECM) and nlc will calculate the ratio of pre and post-tax deductions to offset your FBT liability and maximise your PAYG income tax benefit. Making the Most of Your nlc Novated Lease How do I activate my account? You can activate your account online at nlc.com.au, using your address as your username. Your online account allows you to access important details about your lease, and keep track of your running cost account 24 hours a day, 7 days a week. How does nlc let me know how I am tracking? You will receive monthly s with your account balance. You can also access your nlc account online 24 hours a day, 7 days a week to keep track of your account. How do I pay for my fuel? You will receive your nlc Fuel Card in the mail within 10 business days of taking delivery of your car. Check the registration details and vehicle description on your card. If correct, your fuel card is ready to go and does not require a pin. After filling up, simply present your card for payment at the service station and remember to enter your odometer reading to help us keep track of your budget and maintenance. If the details are incorrect please contact us and we ll issue you a new card. What happens if I lose my nlc Fuel Card? If your card is lost or stolen, please notify us immediately. We ll cancel your current card and reissue you with a new card as fast as possible. Please keep in mind, you are responsible for all transactions on the card until the loss is reported. Where can I find a list of nlc approved mechanics for service and repairs? nlc has an established network of over 5,500 approved merchants nationwide including dealerships, mechanical repair centres, major tyre outlets, specialist repairers, automotive glass replacement and Roadside Assistance services. Use our Fuel and Repairer Network map at nlc.com.au/mynlc to find your nearest provider. What steps do I take when servicing my car? First step is to find the nearest nlc approved provider via our website. When booking your car in, please make them aware you are an nlc customer. This makes sure the service provider calls our Repair Assist team for an order number before starting work on your car. What if I have to use an nlc non-approved provider? In the unlikely event of limited coverage in your area, don t worry, you can just pay for the expense and seek reimbursement from nlc. Suppliers can also join the nlc network of registered merchants by taking a couple of minutes over the phone and completing a form with us. Who pays for the service and repairs on my car? If your car is booked with one of our 5,500 approved merchants nlc will be invoiced directly for your repairs. The amount will then be deducted from your online running account. If you use a non-approved merchant, you ll need to pay for the repairs and submit a nlc Expense Payment / Reimbursement Claim form. All forms are available on our website nlc.com.au/mynlc. 7 Does nlc pay for my registration renewal each year? You can elect to have nlc pay your registration renewal for you. When your renewal arrives, check all the details are correct, complete your renewal notice and the nlc Expense Payment / Reimbursement Claim form and scan and send copies to us. Do not send originals. nlc requires up to 10 working days to pay your registration after receiving your forms, otherwise you need to pay it directly and claim reimbursement from nlc. Can I pay my rego renewal myself? If it s easier for you to pay the registration renewal yourself, that s fine go ahead and pay the full amount to your local Road Traffic Authority. To claim reimbursement from nlc complete the Expense Payment / Reimbursement Claim form and provide a copy of your payment receipt. These forms can be scanned and ed to us. Please don t send originals. If you don t receive your renewal notice, contact your local Road Traffic Authority before the expiry date of your vehicle s registration. Please note; your car is registered in your name and it is your responsibility to make sure it is always registered. What happens if I leave my employer? If you re leaving your employer, call us as soon as possible so we can discuss the following options available to you: 1. Re-novate the vehicle with your new employer, if your new employer s salary packaging allows. You ll need to sign a new novation agreement with your new employer and fleet provider to continue to manage your novated lease. 2. Continue to make lease payments as a direct debit until the lease ends or until you wish to payout the vehicle. The lease term remains unchanged and your residual amount will still be due at the end of the lease. Under this option all of your running costs will be at your own expense and paid for from your post-tax dollars. 3. Payout the vehicle lease and take ownership of the vehicle. You can request a payout figure which will be ed to you within 3 business days. 4. nlc Redundancy Insurance may be available to you in the event you ve been made involuntarily redundant. For further details call nlc insurance on What happens if I spend more than budget? What happens if I spend less than budget? At the end of your lease any unused funds are returned to your employer. Once any adjustments are made and PAYG tax is deducted, the balance is refunded to you. What is a residual value? The residual value is the amount that remains owing on your car at the end of the lease contract, including GST. Minimum residual values are set by the ATO. Once the term of the lease has expired you ll need to pay the residual value. You also have the option to re-finance the lease for a further term. Can you break a novated lease contract? When you enter into a novated lease, you agree to lease the car for a fixed period of time, so it s important that you choose a lease term that reflects how long you actually intend to keep the car. If you break the lease you ll need to pay the remaining lease rentals (GST inclusive) and the residual value (GST inclusive). You ll also incur up to the equivalent of three monthly lease rentals as a penalty. Your running cost balance is not included in the payout figure and is reconciled separately once nlc receives all outstanding expenses for your car. What other factors should I consider before choosing a novated lease? Leasing represents a significant financial commitment and involves some risks and responsibilities that you must understand before entering into a leasing arrangement. You are encouraged to seek independent financial advice to determine whether a novated lease is right for your financial situation. If there is a change in the tax legislation your salary sacrifice amount will be adjusted to reflect the increase/decrease in the amount of tax payable. Your employer provides a novated lease program to allow you to extend the value of your remuneration. All vehicle costs associated with the provision of the benefit are borne by you. Your employer will not incur any additional cost as a result of your decision to enter into a salary packaging arrangement. In the event that you cease to be employed for whatever reason, your employer s obligation to pay the lease stops and the obligation reverts to you. If during your lease you spend more that budget, nlc will contact you to increase your pre-tax payment. If at the end of your lease your balance is negative, nlc will invoice your employer for the shortfall and your employer will recover any funds due from your directly. Call us on or visit nlc.com.au to find out how much you can save. THE BMW GROUP GUIDE TO FLEET FUNDING. autopia.com.au Intelligent Car Ownership If you read this guide and don t want to package your car you should read it again. optimizer Key Facts An introduction to the benefits available to you through the optimizer Salary Sacrifice Car Scheme. salary sacrifice schemes for cars: decision maker s guide The decision maker s guide Introduction Salary have attracted increased levels of interest from fleets and the media over the past couple of years.